Before we will play with code download and open documentation. Its our holy book :). We will draw +5V from Raspi, its not the best way but enough for this tutorial. This part wont require any additional installations. Raspi out of the box is ready. There are few kinds of char screens. It goes for size and pin outs. We have lots of way to connect LCD with Raspi. First we will focus on using GPIO pins as its the simplest way. You may use 20/4 or 16/2 with pins on top, there is also version with pins on left. I’m using 20/4 top pins but our code will support all combinations. As you can see we will be using 6 GPIOs. 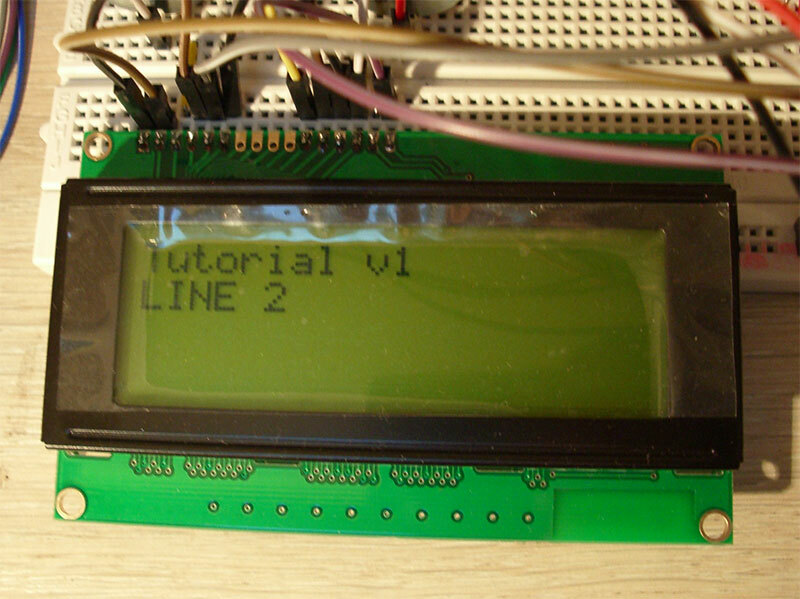 Not much but if you want to plug more than one LCD… well it would be better to use I2C – but this later. Using only 4 data signals is possible because HD44780 support 4bit and 8bit interface. 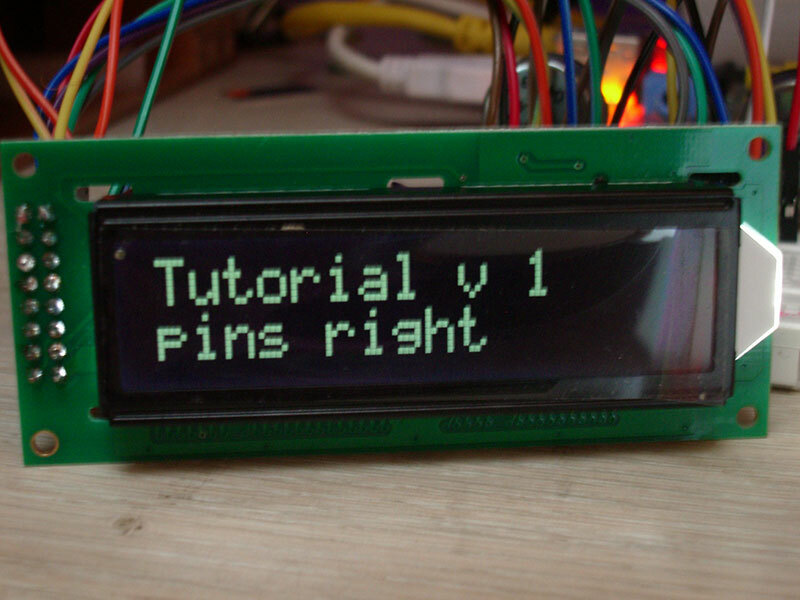 Now adjust potentiometers so you will some some backlight and something on the screen. After powering you should see one line of squares. WARNING: DB0 – DB7 may work as input or output. Output is +5V – it may damage your Raspberry Pi ! Double, triple check if R/W is connected to the ground ! And because of this we wont read busy signal from LCD, we will just sleep for some time. Each cell on LCD have its own address. Each line begins with each address. So we define beginning of 4 lines. 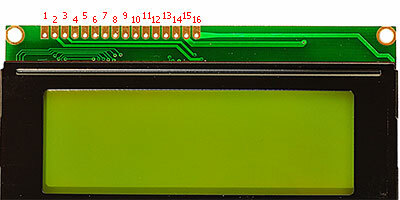 Maximum for this type of LCD is 20 chars per 4 lines. But you probably saw 40 chars / 4 lines – they are actually two LCDs in one. Don’t worry for now, later we will plug such screen. Lets look at __init__(self, width, height). Its very simple and incomplete for now. We are sending width and height but never use them. Next we define pins and separately data pins. Data pins will make our life easer in self._write function. Now time for important function init(). First we setup GPIO pins and set output to 0. At this point we have GPIOs ready, LCD ready and all wiring ready. Time to initialize screen. Open documentation and search for Initialization of the HD44780. You will read in what state is LCD after boot. Next are two sections 8bit and 4bit initialization. We are going with 4bit one and using only DB7, DB6, DB5 and DB4 as data input. In 4bit mode we are sending 8bit in 2 steps, first high bits and next low bits. After start LCD is in 8bit mode but we need 4bit mode. Now lets look at documentation. We need to setup our screen. To do this we need to send command. We need to send DB5 & DB4 (its 3), wait and do it three times. Next we need to tell LCD that we want 4bits mode. So just send 2 (only DB5 = 1). Because we are in 8bit mode and we are sending only DB5 – others bits are undefined. After setting 4bits mode we need to set settings again. So we need two send function, one that works in 8bit mode (just send high bits) and second that send high and low bits. That’s why we have self.cmd(self, c), self._write(self, c) and self.cmd4(self, c), self._write4(self, c). First send high and low, second only 4 high bits. Hex 0x28 is binary 0010 1000, position of first 1 tells us that this is Function set. Now decode it, after 1 is DL bit – it tells if its 4 or 8 bit mode. We have 0 – 4 bit mode. Next we have N bit = 1, so we have two lines. Next is F bit = 0, 5×8 dots per char. Last two 0 are irrelevant. And after all this we are ready to display something. Last two functions are to display char on screen or string. Its very simple code to display string on screen. Its not aware of LCD size and doesn’t have functions to format input. Its also GPIO only version. In next tutorial we will extract functions that drive a hardware into driver class. It will allow us later to add different kind of drivers, for I2C, larger screens and other strange wiring methods.